I just spent something like an hour preparing food to go into my bento box for tomorrow's lunch and breakfast. I mention this because it was an extremely enjoyable hour. This whole thing of slow food--taking time to make real food, and present it (even just to yourself) in an attractive way--is very soothing. It's a great outlet for creativity. It's a great way to spend time. May 29th lunch and breakfast bento box, by DarkEmerald. A few notes: Top tier: yes, those are Brussels sprouts. I love those things. In between them? Real Scientific Test Tubes filled with soy sauce. Middle tier: same breakfast as every day: cottage cheese (sometimes it's yogurt), mung beans, and some fruit. 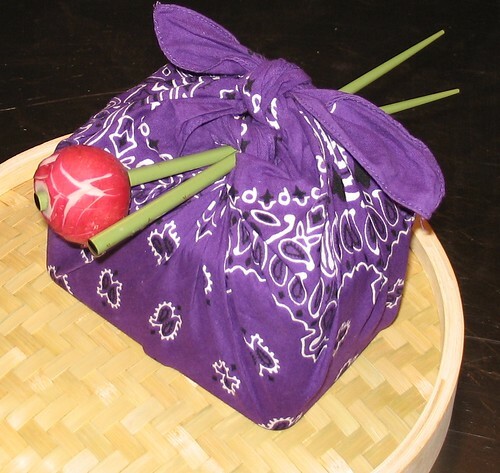 Bottom tier: Onigiri (rice balls) wrapped in nori (seaweed), tamagoyaki (rolled omelette), carrot dividers and a radish rose chopstick-stopper. Radish rose: great way to add one more vegetable, on the outside, and help keep the chopsticks from slipping out. That is so beautiful! There is something so satisfying and exciting about eating food that is well presented. Lovely color mixtures, variety in textures and flavors. It must smell heavenly when you open it up for a meal. Your body just feels more nurished and satisfied after seeing this. I can just imagine how much it improves digestion, obsorbtion and evacuation. The entire cycle is improved. And what a convenient way to carry two meals! Congratulations on finding happiness in the kitchen, preparing foods that have no guilt, no chemicals, no empty foods. I see this as the wave of the future. People returning to what the kitchen was made for. Preparing foods with love and care. Yumm!!! Everything you say is true. The whole bento-box concept depends on a certain mix of vegetables and protein. To get all the calories I need for two meals in there, I have to be very specific and careful, and the dang thing is quite heavy! There's no room for sugar or empty snacks. 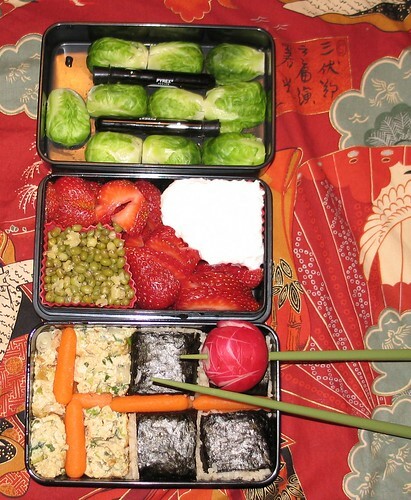 Even salady things have to be denser and more compact--lettuce would be a waste of bento-box space. The whole love-in-the-kitchen thing has revealed itself to me rather late in life. I could say that it's because I've almost always lived alone, but how sad is that? It's great to find some kind of self-love, and amazing in a way that it manifests through food. That is beautiful!! And looks delicious. I've had a love/hate relationship with food until recently. I've put a lot of effort into finding healthy foods I really enjoy and my whole outlook has changed. And this just gives me more ideas. My relationship with food has only recently turned from love-hate to just love. It's a great transition to make! As I mentioned above to roseambr, filling a bento box is an exercise in right eating. Sure, you could stuff it with potato chips and cake (one woman, whose bento art I admire greatly, has been known to put pizza in hers), but getting enough calories into the box in right proportions pretty much forces a mix of veggies, carbs and protein. And preparing food in small bits that don't clash with one another and can be eaten cold requires a whole new approach, if your food prep background is as purely Western as mine is. Can't remember if I referred you to Lunch In A Box. It's the ongoing lunch/bento blog of a woman with a preschooler. Might provide you some great inspiration as your little girl gets older. It's really quite the new hobby. Can I bug you about the mung beans? I have some sitting in a cupboard and I have absolutely no idea what to do with them. I've never had them before and the bag they're in doesn't have a suggested recipe or anything on it, just instructions to soak before using. Most of the recipes I've seen online turn out to be for the sprouts, not the beans themselves. So, if you don't mind my asking, what did you do with them here? It looks fairly simple (which is pretty much where my cooking abilities are at) but appearances can sometimes be deceiving. Happy to oblige--what little I know. Mung beans are nearly unique in the bean world (as I understand it) for NOT needing to be soaked. My first intro to them was Chinese mung bean soup--which is just boiled mung beans, chilled and served in their cooking liquid with quite a bit of sugar, kind of like cereal. These days, I just cover about half a cup of mung beans with a good bit of water in a small covered saucepan, bring them to a boil, let 'em boil for five minutes or so, then turn them down and let them simmer, covered, for another 20-25 minutes. I just mostly eat them well-drained and plain. I don't need the extra sugar, but that Chinese "soup" approach is very nice on a summer night--cooling and refreshing. Sorry I don't have more brilliant recipes. I find plain not-overcooked mung beans to be mild, comforting, and nicely filling. Ooo, "put in water; take out of water" is my kind of recipe!